NOTABLE LANDMARKS The Forbidden City in Beijing; the Terracotta Warriors of Xi'an; the fabled Silk Road cities of Tashkent, Samarkand, Bukhara and Khiva; Red Square and the Kremlin in Moscow. Day 1. Train from Beijing to Xi’an. You can use one of our Beijing options if you have not been to Beijing before. Or we can book the night prior to departure at a hotel within walking distance of the train station. Arrive Xi’an. Met and transferred to accommodation. Xi’an was considered the eastern terminus of the Silk Road and from here the various routes fanned out through the central southern and northern Asian regions towards Europe and Russia. The city was fortified with formidable walls and grew to be a major strategic point. Day 2. Xi’an. Full day guided visit to the Terracotta Warriors & Horses and the restored city walls. Day 4. Make your own way to station for the train Xi’an to Urumqi. Day 5. Arrive Urumqi in the morning morning. Free day for sightseeing. Guided sightseeing is optional. Alternatively, you can fly into Urumqi to begin your train journey. Urumqi is the heart of the Uighur region of northwestern China, located in a fertile oasis. Due to these attributes it became an important transit point on the grand route. There is a dedicated Silk Road Museum here. Day 6. Free day for sightseeing around Urumqi, possibly an excursion to Heaven Lake. Guided sightseeing is optional. NOTE: depending on the season this day could be deleted as during peak period trains are more frequent. Day 7. Depart to Almaty. Note: Timetables may vary seasonally. Usually there are 2 services a week in the off season and daily in high season. Time taken is usually around 24 hours, but departure time can mean it is over 2 days (this is where variations in the programme may be unavoidable). Day 8. Arrive in Almaty, the major city of Kazakhstan (although no longer capital) where you will be met by an English speaking guide and transferred to your accommodation. The day and the following morning are free to explore the booming city once known as Alma-Ata. Guided sightseeing is an optional extra. Depending upon your personal requirements, Almaty provides the opportunity to organise some of the visas required for the onward journey. Day 10. Evening departure by train for Tashkent. Day 11. After arriving at Tashkent you are met and transferred to your hotel. Tashkent is the capital of Uzbekistan and offers up modern Uzbek buildings with their Soviet overlay, due to a major earthquake in 1966. Markets abound and the city also provides another opportunity for visas if required. Day 13. Make your own way to railway station for train to Samarkand. Upon arrival met and transferred to your accommodation. Day 14. Samarkand. 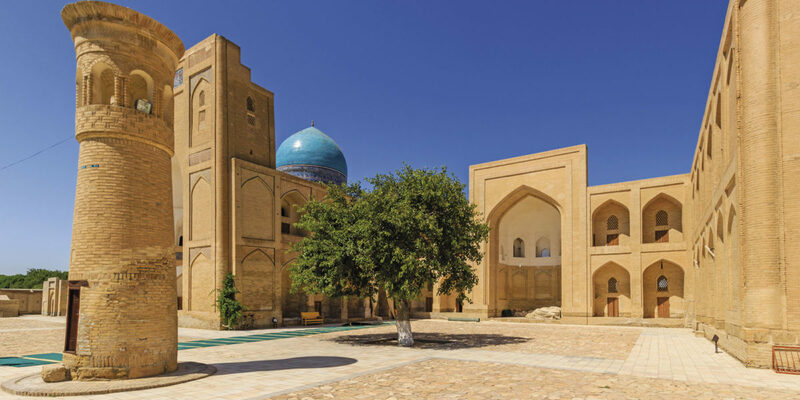 Morning city tour starting at 09:00 am, can include some of the following: Gur Emir Mausoleum, The Registan, State Museum of the Cultural History of Uzbekistan, Samarkand bazaar, Bibi Hanum Mosque. Shakhi Zinda Ensemble from 7-17th centuries. You can see here the mausoleum of Islamic prophet Ibn Abass. Hoja-Nisbaddor mosque Ulukbek Observatory, Ancient Samarkand, The Afrasiab Museum. Balance of the day is free. Day 15. Day trip to Shakhrisabz, a scenic drive 80 km from Samarkand. This excursion includes visits to Timur’s Summer Palace Ak Saray, dating from 1380 AD, plus the Dorut Tilovat complex which includes the Kok Gumbaz Mosque and Dorus Siadat Mausoleum. Day 16. Make your own way to railway station for morning train to Bukhara. Met and transferred to accommodation. Day 17. Bukhara. City tour can include some of the following; Labi-Hauz, statue of Hoja Nasreddin, Nadir Devanbegi Medressa (1630), Nadir Divanbegi Khanaka-17th c., Kukeldash Medressa -16th c., Jewish quarter-12th.c., Covered bazaars, Taji-Sarrafon Area-12th.c., Taqi Telpak Furushon Area, Ulugbek Medressa (1417), Abdul Aziz Khan Medressa (1652), Kalon Minaret (1127), Kalon Mosque-16th c, Mir-i-Arab Medressa-16th.c., Amir Alimkhan Medressa, The Ark (Reception & Coronation Court, Friday Mosque) 5th c., Registan, Zindon, Bolo-haus Mosque, Ismail Samani Mausoleum (completed about 905 AD), Shaibonid town walls, Chashma-Ayub mausoleum 12th c. Buyan Khuli Khan & Saifuddin Bukharzi Mausolea-14th c.
Day 18. Further exploration of Bukhara. Excursion to visit summer residence of the Emir Bukhara Mokhi Xosan, Naksh Band memorial complex. Visiting cemetery at Chor Bakr. Day 19. 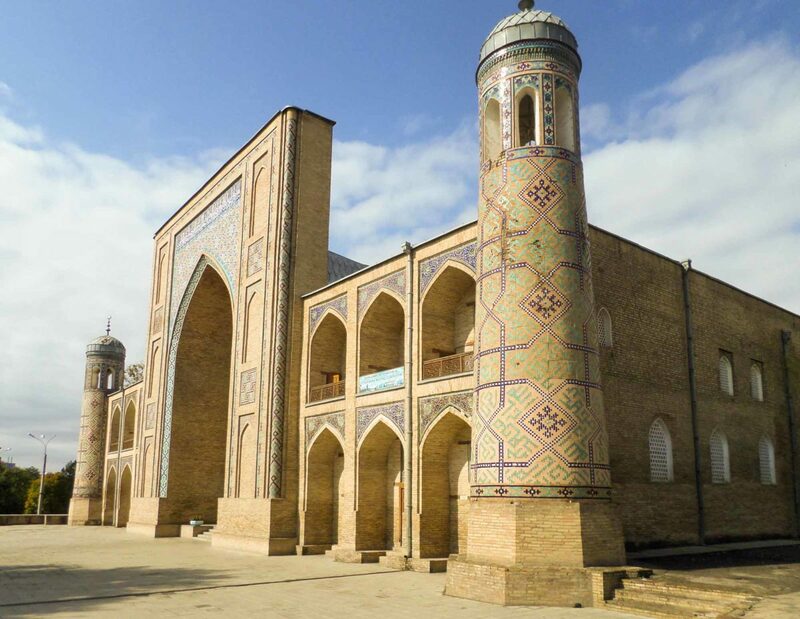 Drive by private car from Bukhara to the equally ancient city of Khiva. Day 21. Drive to Nukus via Khorezm Castles. Visit Nukus Museum. PM transfer to airport for flight to Tashkent. Upon arrival met and transferred to your accommodation. Day 22. Free in Tashkent. NOTE: We can add the city of Urgench, but experience shows that the classics have been well covered in the above plan. Days 24-25. On board train – you know the routine – chess, Lord of the Rings trilogy and watching the cinema of Central Asian and Russian landscapes flow past your private screen – the cabin window. Day 26. Following an epic 3-night train journey, you arrive at Moscow and will be met and transferred to a homestay. Three hour introductory walking tour to orientate you to the transport system and central Moscow. Time to experience the famed centre of Soviet-era Russia. This is where central control was wielded. It is now a changed city, but its many surviving examples of architecture complement its thriving theatre and arts and for those so disposed has museums to satisfy any interest! Day 29. Services end after breakfast, or take our St Petersburg extension. Day 29. Moscow free day – or optional sightseeing. Own way to train station for late afternoon/early evening fast train to St Petersburg. Upon arrival met and transferred to accommodation. Day 30. Today your walking guide will meet you for a three hour introductory walking tour. This will orientate you with regard to where you are staying, how to get to main area of sightseeing and the public transport system. Optional sightseeing suggestions. Days 31-33. St Petersburg free days. Day 34. End of arrangements. Well, we can extend your stay, or perhaps a train to Helsinki or the Baltic States? There were many variations of the route that became known as the ‘Silk Road’. This is one route which is relatively easy and safe to follow. The assorted routes of the Silk Road didn’t remain static over the course of time – they changed for various reasons. Some gained significance and flourished, while others ceased to exist, causing the decline of the towns and settlements in their path. That cliché phrase, ‘Lost in the Sands of Time’, is a reality when you follow the Silk Road. 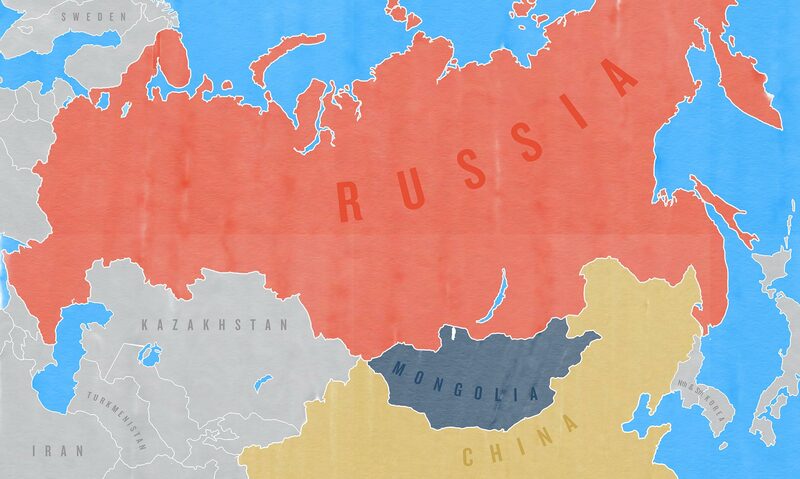 This programme covers four countries, travelling from Beijing across Central Asia to Moscow. The direction of this itinerary is Westbound, with weekly departures, travelling independently. The epic journey starts with a four day/three night train trip from Beijing to Urumqi in far western China. Then it is off to Almaty, the largest city of Kazakhstan, again by train. Alternatively, you may fly into Urumqi and start there if you wish. There is time to explore Almaty before departing by train or bus to Uzbekistan’s capital, Tashkent. From Tashkent you travel by bus and private car to visit the cities of Samarkand, Bukhara and Khiva. 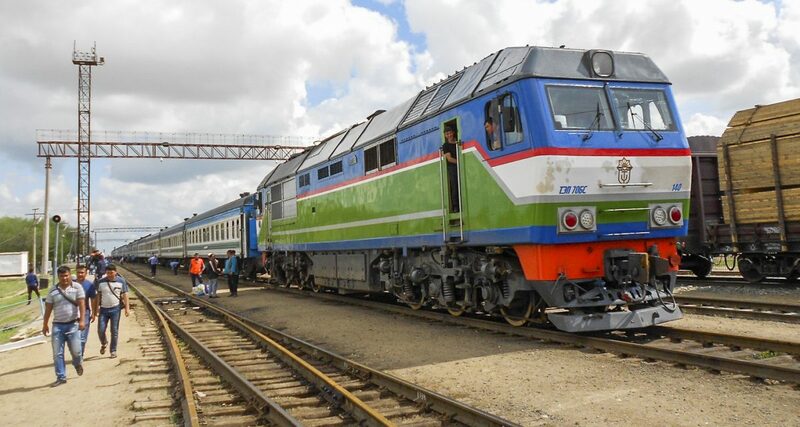 At present it is best to return to Tashkent for the onward train trip to Moscow. You then finish with three nights in Moscow. This is a sample itinerary and is fully customisable to suit your requirements.